The Amazon Fire TV and Fire TV Stick have three options you can turn on or off in a menu labeled “Developer options.” Those three options are “ADB debugging”, “USB debugging”, and “Apps from Unknown Sources.” Even if you’re not a developer, there are situations where it’s handy to have some of these options enabled. Other times, having these options turned on can cause issues. Here’s an explanation of what each developer option does, when it should be turned on, and when it’s best to leave it off. The “Developer options” menu is located in the Fire TV and Fire TV Stick’s “Settings” menu under the “System” section. If you need detailed steps for how to turn these options on, see my guide for enabling ADB debugging or my guide for enabling Apps from Unknwon Sources. This option allows your Fire TV to accept connections through the Android Developer Bridge. I won’t go into too much detail about it, but the Android Developer Bridge, or ADB for short, is a powerful utility that allows someone to remotely perform actions on the Fire TV. With ADB debugging turned on, one can connect to the Fire TV and do many different things like installing an app or controlling the device remotely. Many of my guides require ADB debugging to be enabled in order to make changes to the Fire TV operating system. Some apps need ADB debugging turned on, like FireStarter, for them to function correctly because they use ADB to communicate with the Fire TV. While using your Fire TV from your home network, it’s safe to keep ADB debugging turned on all the time if you find yourself needing to use it often. It’s only when connecting your Fire TV to a public network, like in a hotel or school campus, that leaving ADB debugging turned on could be a security issue. With ADB debugging turned on, a malicious individual just needs to be on the same network and know (or guess) your Fire TV’s IP address to gain control of the device. For the most part, it’s best to turn ADB debugging off when traveling with your Fire TV and fine to leave it on when using the device at home. Just understand that ADB connections are very powerful and can ruin a device if the wrong commands are used, so be sure you’re following a trustworthy guide if you’re running ADB commands that you’re unfamiliar with. Enabling this option allows you to use a USB cable to make a wired ADB connection to your Fire TV. ADB connections, as discussed in the previous section, are normally done over the network without the need to physically connect to the device. To create a wired ADB connection, you will need an A-to-A USB cable to do this with the Fire TV, but can use the included micro USB charging cable to do it with a Fire TV Stick. The “USB debugging” option only becomes available once you turn on the “ADB debugging” option. Enabling USB debugging is not more secure than just enabling ADB debugging because, with USB debugging turned on, one can still connect to the Fire TV over the network. All ADB commands possible over the network are equally as possible over a USB cable. The most important thing to remember when turning USB debugging on is that it prevents the Fire TV’s USB port from working with USB drives and USB peripherals like mice, keyboards, and game controllers. Readers often email me asking for help because their Fire TV USB port “does not work with anything,” and it’s always because they forgot that they enabled USB debugging. Using ADB over USB instead of through the network is handy if you have a poor network connection or want to transfer large files from a PC to the Fire TV via ADB. File transfers to the Fire TV over a USB cable are often much faster than ones over the network. Just remember to turn USB debugging back off after using it or you may find yourself scratching your head as you try to figure out why your USB device no longer works with your Fire TV. This option simply allows apps already installed on your Fire TV to install apps. 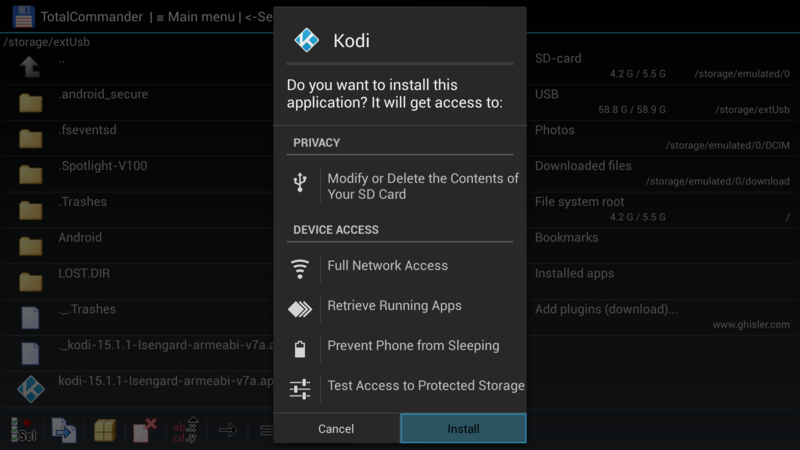 This option does not need to be enabled for you to sideload apps via ADB. The most common scenario for needing this option turned on is if you’re sideloading apps with a file browser like ES File Explorer or Total Commander. You will also want to enable this option if you are using an alternate appstore, like Google Play, otherwise the appstore will not be able to install apps on the device. Anytime an app tries to install an app, the Fire TV will always prompt you to explicitly approve the installation, so there’s not much of a security concern with always leaving this enabled. That is, as long as the person using the Fire TV isn’t the type to approve a prompt without understanding what it’s doing. So if you often use apps to install other apps, you can leave this on for convenience, but if your Fire TV is used by kids or less tech savvy individuals, it’s probably best to only turn it on when necessary, so that someone doesn’t unknowingly approve the installation of a malicious app. Thank you for mentioning the “Total Commander”. Hi, what do I do if USB debugging and apps from unknown sources are not available on my fire tv? I hAVE no USB debugging option available, trying to get rii remote to function. same problem the USB DEBUGGING option is not available on my fire tv box..
does my adb debugging has to be turned on in order for me to install add-ons?